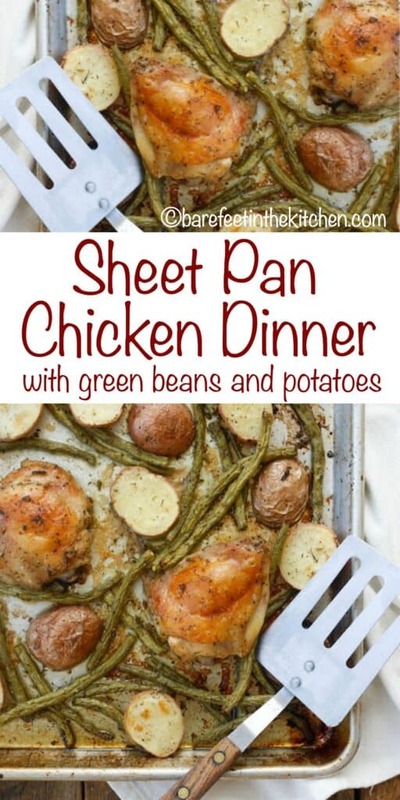 This easy sheet pan dinner with baked chicken thighs, baby potatoes, and fresh green beans has become a favorite in many of your homes over the past two years. This is such an easy dinner recipe and we make it at least once or twice a month. It only takes about 5 minutes effort to toss the chicken, potatoes, and green beans in a simple lemon and herb vinaigrette before being roasted until tender and crisp. The ease of baked chicken is something that I don’t take for granted. When I was learning to cook, I must have looked up “how long to bake chicken” at least a hundred times. No joke. I finally wrote the average cooking times on the inside of my recipe notebook. It was never as simple as just popping it in the oven and walking away, until now. There are so many great baked chicken recipes that I rely on now for weeknight meals. These are some of our favorite baked chicken recipes: Crunchy Baked Chicken with a hint of heat and plenty of crunch from a surprising ingredient, Sticky Asian Chicken is an easy 4-ingredient recipe that is going to rock your weeknights, and last but not least, this Oven Baked Crispy Chicken is a 2-minute prep recipe that everyone loves. Whoever invented the sheet pan really should be given a medal. I use my half-size sheet pans at least once, if not multiple times a day. Sheet pan dinners are one of my favorite ways to use them. All other baked chicken recipes aside, this Sheet Pan Dinner with Chicken, Green Beans, and Potatoes is probably going to remain my favorite for a long time. It takes less than 5 minutes to pull this entire chicken dinner together and get it into the oven. 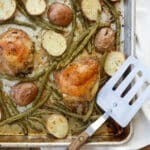 Just scatter the chicken, green beans, and potatoes across the baking sheet. Drizzle with the lemon vinaigrette and bake until done. While it’s cooking, you’re free to walk away from the kitchen. Your house will smell amazing and everyone will think you spent your day working hard in the kitchen. The baked chicken in this dinner turns out wonderfully juicy with crisp skin every single time. My whole family wanders into the kitchen and sneaks these green beans straight off the pan almost as soon as it’s out of the oven. 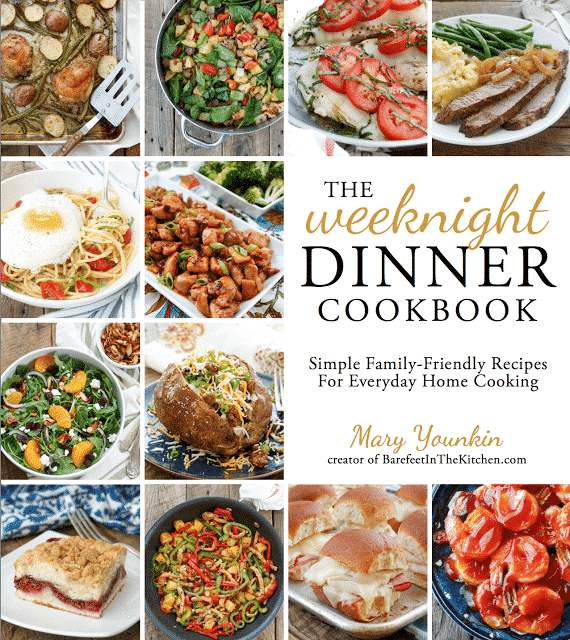 Two years ago, my first cookbook, The Weeknight Dinner Cookbook, was released and I still love these recipes every bit as much as I did the day I submitted the manuscript. Hearing how much you love these recipes is one of my favorite things. The fact that my boys have nearly cooked their way through the book now all by themselves makes me grin every time I see them in the kitchen. Sharing my love of food and cooking for others are two of my favorite things. My hope is that this book has brought you more joy in the kitchen and many happy meals shared with family and friends. Preheat oven to 400°F. 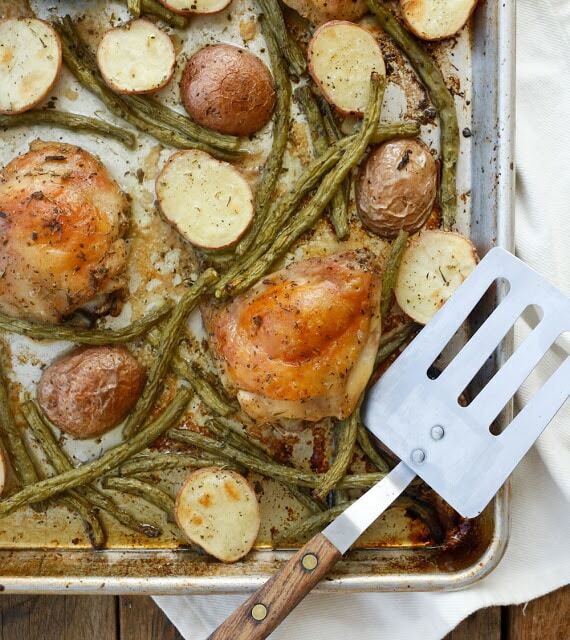 Place the chicken, potatoes, and green beans on a large baking sheet. Stir the olive oil, lemon juice, garlic together with all of the spices. Drizzle the spice mixture over the meat, potatoes, and vegetables. Use your hands to stir the pieces around a bit and make sure everything is well coated. Leave the chicken skin-side up. Place the pan in the center of the oven and roast for approximately 50 minutes, until the chicken is golden brown and cooked through. The potatoes should be tender and slightly crisp and the green beans should be browned, crisp, and somewhat shriveled. If you have Italian Seasoning Mix in your pantry, you can substitute 1 tablespoon of the seasoning mix for the herbs marked with an *. If extra crispy green beans aren’t your thing, you can place the coated beans in a bowl and wait to add them for the last 15 minutes of the cooking time. Just spread them around the pan over the potatoes. Stir the olive oil, lemon juice, garlic together with all of the spices. Drizzle the spice mixture over the meat, potatoes, and vegetables. Use your hands to stir the pieces around a bit and make sure everything is well coated. Be sure to leave the chicken skin-side up. Place the pan in the center of the oven and roast for approximately 50 minutes, until the chicken is golden brown and cooked through. The potatoes should be tender and slightly crisp and the green beans should be browned, crisp, and somewhat shriveled. Enjoy! If your potatoes are bigger than about 1-inch in size, you’ll want to quarter them (instead of simply halving them) to make sure they pick up plenty of flavor from the seasonings. This recipe can easily be doubled. Simply use two sheet pans. Depending on how your oven cooks, you may want to rotate the pans halfway through the cooking time. I doubled this thinking I would have some for leftovers, but I only have the one portion I set aside before bringing the sheet pan to the table! My whole family loved it and it was super easy. My kids argued over the green bean “fries”...the crispiness was a huge hit! Thank you for sharing this awesome recipe! It was super easy and delish! I love sheet pan dinners. Thanks for sharing! I love sheet pan dinners, but my family is not a fan of chicken thighs. What kind of cooking time modifications would I need to switch from chicken thighs to small chicken breasts? Thank you! If you're using small bone-in chicken breasts, the cook time will be about the same. You'll just want to watch the oven to make sure they don't overcook. We make this almost weekly. It’s never failed us. I didn’t have green beans, but used fresh Brussels Sprouts and mushrooms...so good! Next time I’m going to skin the chicken and use a bit more olive oils for a healthier take. I'm thrilled that you enjoyed the recipe, Mellie! Thank you for a super easy super yummy new mainstay. This is now my go to at least once a week, asi almost ALWAYS have these ingredients on hand. Last week i made it using just bottled italian vinagarette, and well drained, canned green beans (2 cans because the green beans are the best part! )....and it was still AMAZING!!!! I'm so very happy that you love it, Jennifer!